Example 1. We wish to model annual income using years of education and marital status. However, we do not have access to the precise values for income. Rather, we only have data on the income ranges: <$15,000, $15,000-$25,000, $25,000-$50,000, $50,000-$75,000, $75,000-$100,000, and >$100,000. Note that the extreme values of the categories on either end of the range are either left-censored or right-censored. The other categories are interval censored, that is, each interval is both left- and right-censored. Analyses of this type require a generalization of censored regression known as interval regression. We have a hypothetical data file, intreg_data.dta with 30 observations. The GPA score is represented by two values, the lower interval score (lgpa) and the upper interval score (ugpa). The writing test scores, the teacher rating and the type of program (a nominal variable which has three levels) are write, rating and type, respectively. Graphing these data can be rather tricky. 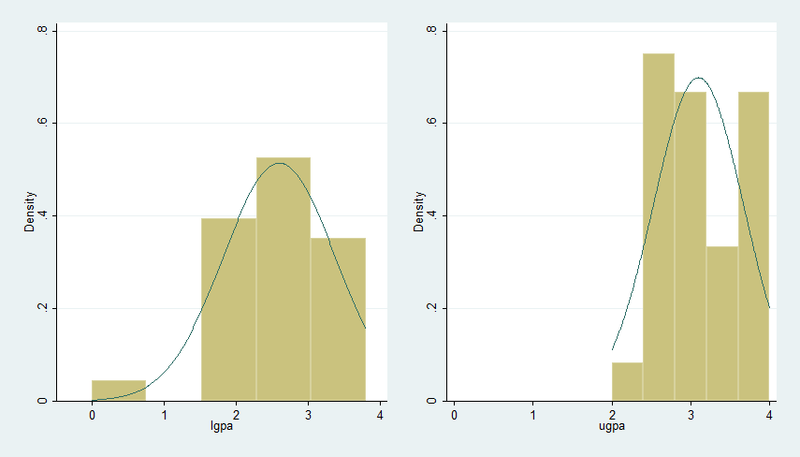 Just to get an idea of what the distribution of GPA is, we will do separate histograms for lgpa and ugpa. We will also correlate the variables in the dataset. Ordered probit – It is possible to conceptualize this model as an ordered probit regression with six ordered categories: 0 (0.0-2.0), 1 (2.0-2.5), 2 (2.5-3.0), 3 (3.0-3.4), 4 (3.4-3.8), and 5 (3.8-4.0). We will use the intreg command to run the interval regression analysis. The intreg command requires two outcome variables, the lower limit of the interval and the upper limit of the interval. The i. before type indicates that it is a factor variable (i.e., categorical variable), and that it should be included in the model as a series of indicator variables. Note that this syntax was introduced in Stata 11. The iteration log is given first. It starts by fitting the constant only model, and then the full model (the model with predictor variables). At the top, the number of observations used in the analysis (30) is given, along with a likelihood-ratio chi-square. The likelihood-ratio chi-square tests the difference between the full model (with predictors) and the constant only model. Below that is the p-value for the chi-square with four degrees of freedom. This model, as a whole, is statistically significant. The log-likelihood for the full model is also given. This value can be used to compare models. The table of coefficients contains the interval regression coefficients, their standard errors, z-values, p-values and 95% confidence intervals. The coefficients for write and 3.type are statistically significant; the coefficient for rating and 2.type are not (at the .05 level of significance). The variable write is statistically significant. A unit increase in writing score leads to a .005 increase in predicted GPA. One of the indicator variables for type is also statistically significant. Compared to level 1 of type, the predicted achievement for level 3 of type increases by about .71. To determine if type itself is statistically significant, we can use the constrast command to obtain the two degree-of-freedom test of this variable. This is shown below. The ancillary statistic sigma is equivalent to the standard error of the estimate in OLS regression. The value of 0.29 can be compared to the standard deviations for lgpa and ugpa of 0.78 and 0.57, respectively. This shows a substantial reduction. The output also contains an estimate of the standard error of sigma, as well as a 95% confidence interval. Stata does not compute sigma directly but actually computes the log of sigma (/lnsigma in the output). Finally, a summary of the observations is given. In this dataset, no observations are left- or right-censored, no observations are uncensored, and all 30 observations are interval censored. The two degree-of-freedom chi-square test indicates that type is a statistically significant predictor of lgpa and ugpa. We can use the margins command to obtain the expected cell means. Note that these are different from the means we obtained with the tabstat command above, because they are adjusted for write and rating also. The expected mean GPA for students in program type 1 (vocational) is 2.47; the expected mean GPA for students in program type 3 (academic) is 3.18. If you would like to compare interval regression models, you can issue the estat ic command to get the log likelihood, AIC and BIC values. The intreg command does not compute an R2 or pseudo-R2. You can compute an approximate measure of fit by calculating the R2 between the predicted and observed values. The calculated values of approximately .56 and .71 are probably close to what you would find in an OLS regression if you had actual GPA scores. You can also make use of the Long and Freese utility command fitstat (search spostado) (see How can I use the search command to search for programs and get additional help? for more information about using search), which provides a number of pseudo-R2s in addition to other measures of fit. The Cox-Snell pseudo-R2, in which the ratio of the likelihoods reflects the improvement of the full model over the intercept-only model, is close to our approximate estimates above. cnreg — censored normal regression, in which the censoring values may change from observation to observation. tobit — regression with fixed censored values. Long, J. S. and Freese, J. (2006). Regression Models for Categorical and Limited Dependent Variables Using Stata, Second Edition. College Station, TX: Stata Press. Stewart, M. B. (1983). On least squares estimation when the dependent variable is grouped. Review of Economic Studies 50: 737-753. Tobin, J. (1958). Estimation of relationships for limited dependent variables. Econometrica 26: 24-36.